I split up the abs portion of the big workout I’ve been going through because ten completely different moves all at once can be confusing and there’s nothing I hate more than having to stop my workout to recheck what I have to do next. Last week we did the first four ab exercises, this week we have four more. Next week you’ll get the last two, and then we’ll put it all together! BUT this by itself is a great quick efficient ab workout! All exercises ten reps! Be careful not to push against your head or neck with hands because you can hurt yourself! Table Top Crunch – Lie on your back with your legs up at a 90 degree angle, as if your heels were resting on a table top. Your hands can be behind your head, neck, or crossed over the chest. Curl your shoulders towards your knees and then slowly drop back down. That’s one rep now do 9 more! Right Crossed Leg Cross Body Crunch – Lower legs so feet are flat on the floor then cross your right ankle over your left knee. Support head with hands, and contract your abs as you lift your head and shoulders off the floor bringing your left shoulder towards your right knee and then slowly back down. That’s 1 rep now do 9 more. Left Crossed Leg Cross Body Crunch – Switch sides and repeat for 10 reps.
Straight Leg Hip raise – Put your arms flat on the ground and raise your legs straight up into the air turning your body into a giant right angle. Elevate your pelvis to raise your booty from the floor then slowly lower back to the ground. That’s one rep, now do 9 more. Give yourself about a 15-30 second rest and repeat this sequence for 2 more sets for a quick efficient ab workout! 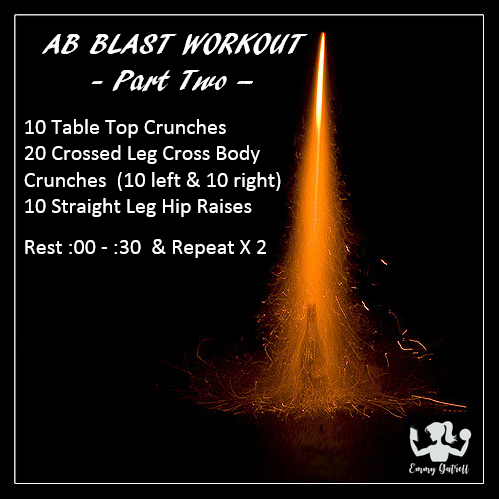 Next week I’ll give you the last two ab exercises in the AB BLAST!